Paris (AFP) – An “armoured” fish living in the Amazon has evolved a remarkable multi-layer defence against the voracious piranha, materials scientists reported Tuesday. Microscopic examination and mechanical testing have revealed the secrets of the arapaima, one of the biggest freshwater fish on the planet. Researchers led by Robert Ritchie at the University of California at Berkeley found its scales have an ultra-tough outer shell, designed to “promote tooth fracture at the point of penetration”. The scales also have a corrugated shape, designed to deflect pressure to a thicker, more elastic layer of collagen that lies underneath. The collagen itself is arranged in twisted overlapping layers, called lamellae, that are around 50 nanometres (50 billionths of a metre) thick. They can slide slightly in response to a bite, causing its pressure to be spread over a wider area. The scales “are a prime example of a biological material’s evolution for a particular function”, says the paper, appearing in the journal Nature Communications. Known in Brazil as the “pirarucu,” the arapaima is a giant carnivore, growing up to four metres (13 feet) in length and weighing more than 200 kilos (440 pounds). 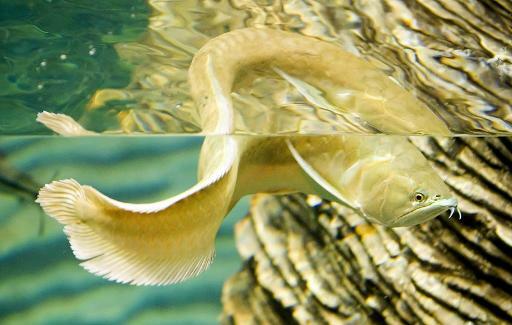 The biggest threat to the fish — Latin name Arapaima gigas — comes from Man. Large numbers began to be taken for food in the 19th century, and the species is now endangered.